It is beautiful, hand made, and completely absurd. Last year about the time of SPIEL Essen, the world's biggest board game convention, rumors started circulating about a ridiculous Pac-Man knockoff game. Later, when Scott Alden of BoardGameGeek got his hands on a copy, it became clear that not only did it exist, but it was handmade, beautiful, and an absolute labor of love. And, apparently, really fun to play. Now you can own it too - since Whacky Wit has an indiegogo campaign for an international edition with rules in English. For only 279 Euros. Did I mention it's handmade, wooden, and beautiful? The game board is made of hand worked wood, with each component lovingly assembled by a team of German workers and given an aluminum plate with a unique serial number. It's also apparently huge - with the creators saying "this game is so large that it does not fit in a closet." Which, I doubt they've seen my closet, but they gave it wall mounts. 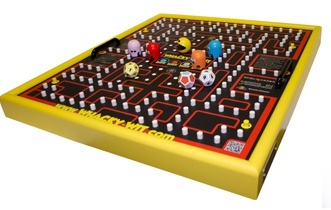 So you can mount the wooden Pac-Man knockoff game on your wall. Right. If you're curious about how the game plays (Hint: It's Pac-Man, but with four people), here's a video of it in action. Whacky Wit's international edition is on indiegogo right now and I have no idea how to feel about it. Knockoff or genius?